Marge Simpson, the woman with the impossibly blue and improbably high hairdo, is a complex woman with an inner life, hopes and dreams, and an incorrigible family that she holds together with healthy homemade helping of common sense. Join the coupon-clipping queen of discount shopping at the nearby Sprawl*Mart, at a meeting of the school PTA, in the middle of a bodice-ripping romance novel, at a theatrical performance of her one-woman show, or in her crusade against cartoon violence, domestic strife, and suburbia's quiet life of desperation...or at least her desperate hope that no one will hold anything that Homer or Bart does against her personally. 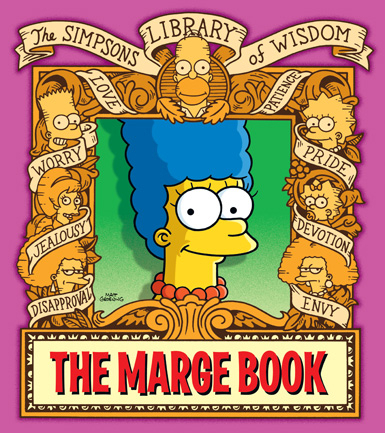 Clean up your room and wash your hands before taking a gander at...The Marge Book!